Native American dream-catchers are a great way to help rid your child of nightmares. 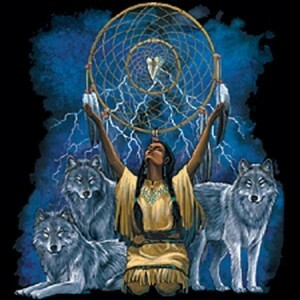 Explain the story of how the dream-catcher catches all your dreams only letting out the good ones. Your little one will sleep safe and sound knowing he’s only going to have good dreams forming. Because monsters under their bed are imaginary, why not give them an imaginary tool to fight off their nightmares? Many parents approach this problem by giving their son or daughter a magic wand or wizard wand. The idea is to tell your child if they have a bad dream to use the magic wand to zap away the bad thoughts. Explain that he/she ultimately has the power to control his/her dreams. Depending on how religious or what religion you are this may vary. But having them say a prayer to god will give your child a sense of security that someone is watching over them, keeping them safe. Of all the parents we surveyed, saying prayers had the most answers for how to help your child from having nightmares. Just like the magic wand, water bug spray gives the child the power to get rid of his/her bad dreams. This method works particularly good when your child has nightmares about snakes, bug or any other kind of creepy crawly. Some parents simply give their child a spray bottle filled with water and tell them it’s special bug spray to keep away the bad dreams. Be sure to keep all other bug spray out of reach so your child doesn’t confuse the two. Tell them this is the only spray that can be used to prevent their bad dreams. Getting rid of your child’s nightmare can be a tough task, but many times you have to figure out why they are having nightmares in the first place. They can occur for many reasons, such as: watching scary movies, hearing scary stories from peers, getting worked up before bed, watching something upsetting on TV or simply feeling anxious about something can all trigger a bad dream. Nightmares aren’t always caused by watching scary movies either. Children have bad dreams because of divorce, family deaths, switching schools or having a parent lose a job. It’s important to find the source of your child’s nightmare, only then will you be able to accurately find a solution.